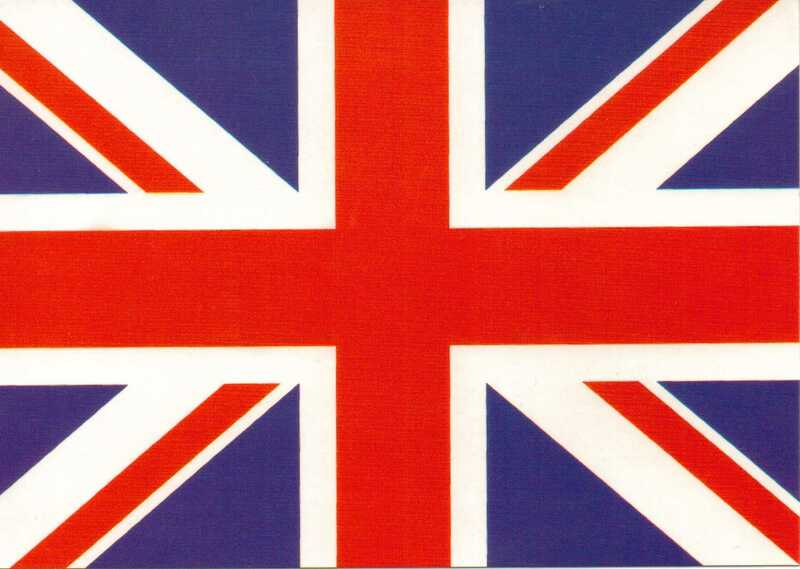 Life in the U.K. – Larry’s update at four months. Here is his take on the first 3-4 months. Larry’s chair in Knoxville is empty these days because, as you know, he is now over here. 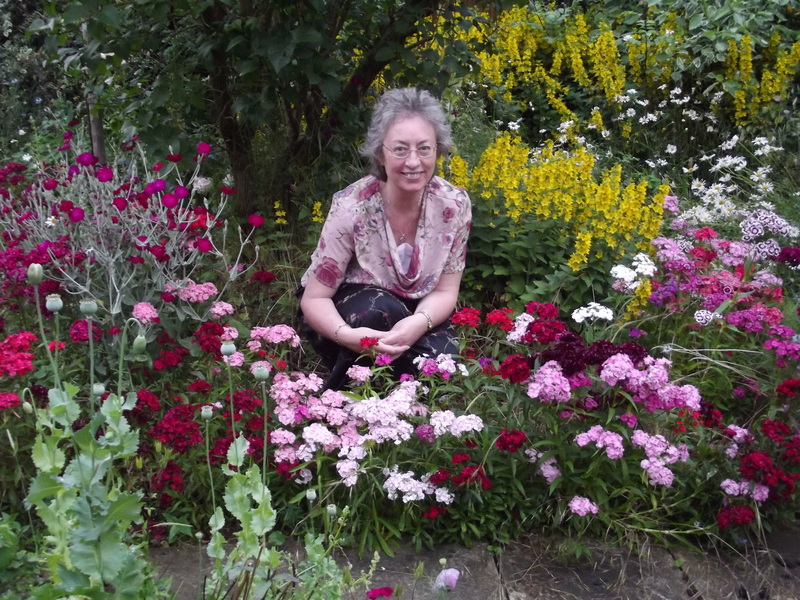 ‘Three Months in England – or is it Four? I must admit I have lost count. Time flies when you’re having fun! • having minor surgery to remove a basil cell carcinoma (my 8th in the past 30 years) from the back of my neck, at no cost! Americans have to contend with pennies (1 cent), nickels (5 cents), dimes (10 cents) and quarters (25 cents). Actually pennies are just used to fill glass jars. Hardly anyone pays with pennies anymore. In the UK there are coins for 1 pence, 2 pence, 5 pence, 10 pence, 20 pence, 50 pence, 1 pound, and 2 pounds. To help out a bit, the 20 pence and 50 pence coins aren’t round – they have seven sides. Why seven and not six sides or eight sides, you ask? No one seems to know. At least in the UK the 10 pence coin is larger than the 5 pence coin. I never did understand why dimes are smaller than nickels. Suburban neighborhoods in the UK are designed for walking. There are paved walkways that go between houses, providing shortcuts that avoid having to walk along busy roadways with almost constant vehicular traffic (you can still choose the paths beside these roadways if you wish, but it certainly isn’t as pleasant). 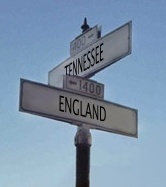 However, sidewalks are called “pavements” in the UK, whereas the pavement in America is the roadway itself. Obviously it’s important here to know what you are talking about. This past month I ran across an interesting postal problem. The U.S. Postal Service will not forward mail to other countries. And Bank of America will not allow its client’s to have a mailing address outside the USA. That means that a form mailed to me from Bank of America never reached me here at my UK address. Since I didn’t receive the form (I was never told it existed) I didn’t return it. Because I didn’t return the form Bank of America deleted the information allowing me to wire transfer funds to my UK bank. Imagine my surprise when I called Bank of America and was told this little story. Fortunately, after also being told nothing could be done to fix this problem, I found an “eagle” in the Bank of America Wire Transfer Services Department who happily fixed it for me. Thank heavens for those few “eagles (I can do that for you)” in a world full of “ducks (sorry, there’s no way to do that – have a nice day!)”. For those who believe universally available healthcare can never work, I suggest you investigate the UK National Health Service (NHS). I have seen the doctor here on several occasions, been diagnosed with skin cancer (again), had the lesion surgically removed from the back of my neck by a Russian dermatologist (she did a beautiful job of it), and I have yet to pay a single farthing! I have not had to wait for treatment nor been inconvenienced in any way. Everyone I have seen has been very professional, competent, courteous and genuinely concerned with my wellbeing. No forms to fill out and patient information is shared between doctors, hospitals, laboratories, etc. for maximum efficiency. I would highly recommend it. For those over 60 who aren’t looking forward to the healthcare issues associated with growing older, the benefits of the NHS are obvious. One of the more obvious benefits of living in the UK involves the way the daily news is delivered, whether by radio, TV, Internet, or printed media. I find the greater focus here on the world’s news events refreshing and enlightening, although sometimes depressing. There’s a lot going on in the world that Americans don’t see. National events here receive appropriate attention to be sure, but reporting of UK events and politics is more reserved, and more time is spent on global events. Perhaps that is due more to geography than anything else, but the contrast with news reporting in the U.S. is dramatic. In the past few years I have grown particularly fatigued with the constant barrage of divisive political reporting in America, usually with obvious bias and unapologetic pandering to a select audience. Walter Cronkite and Edward R. Murrow, where are you…..? I remember a time when elected politicians claimed (believably) to be representing the views of the people who elected them. American political parties now claim that when they lose an election it’s because they “failed to get their message out”. Maybe it’s the people who aren’t getting their message in! Ten’s of millions of dollars are spent by political parties in America to “win people over to their point of view”. Perhaps politicians should spend that money attempting to understand the point of view of ALL the people who elected them, rather than incessantly “selling” the extreme ideology of an over zealous minority through a news media eager to grab the attention of an increasing polarized American public. 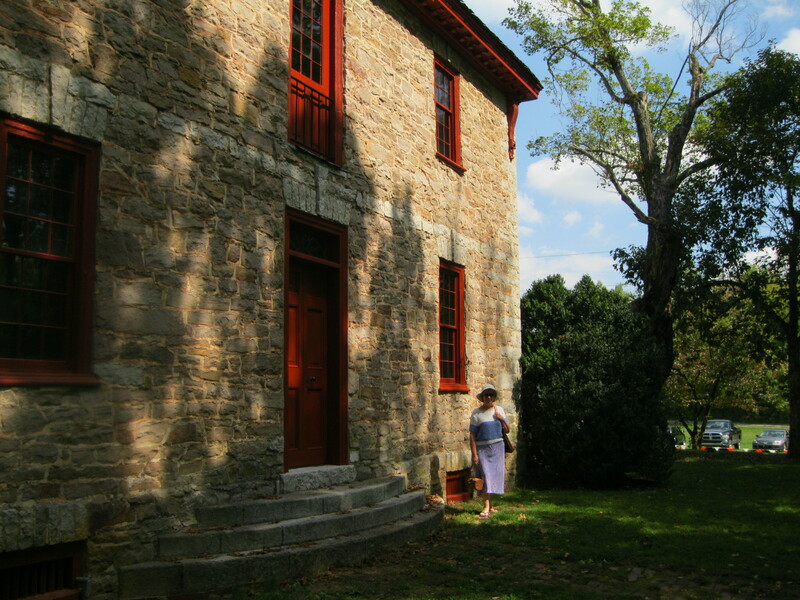 Constructed about 1797 for Francis A. Ramsey, the late-Georgian house has a central passage plan on both floors. Ramsey’s eldest son, William B.A. 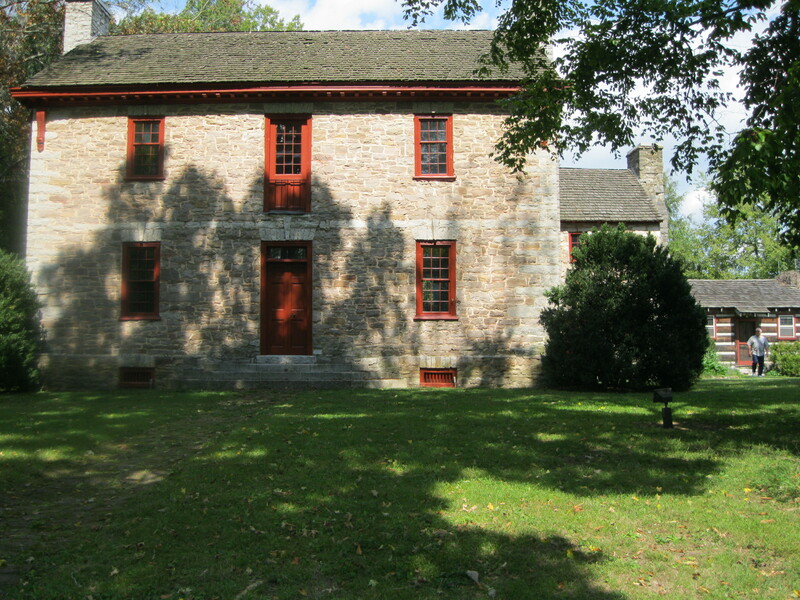 Ramsey, inherited the house in 1820 on his father’s death. In 1840, he sold it to his brother James G.A. Ramsey, who in turn gave it to his son Francis A. Ramsey as a wedding present in 1857. 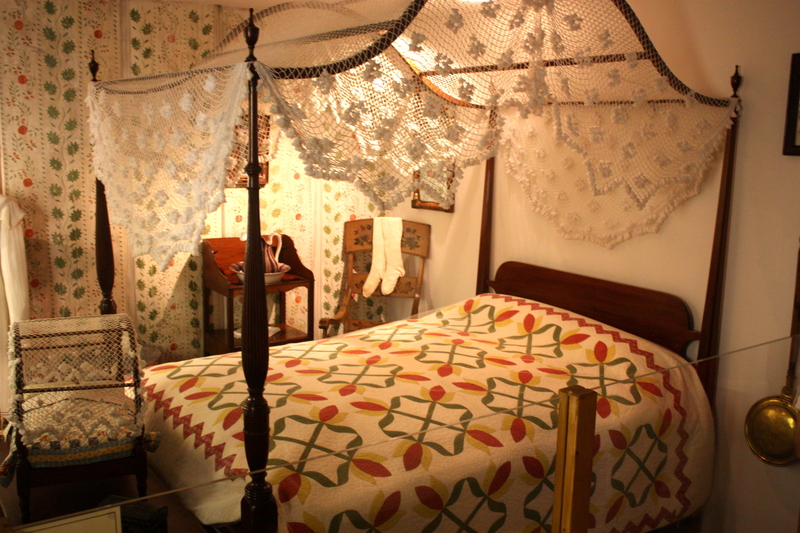 In 1952 Knoxville Chapter of the Association for the Preservation of Tennessee Antiquities purchased the house from a subsequent owner and began to restore it. 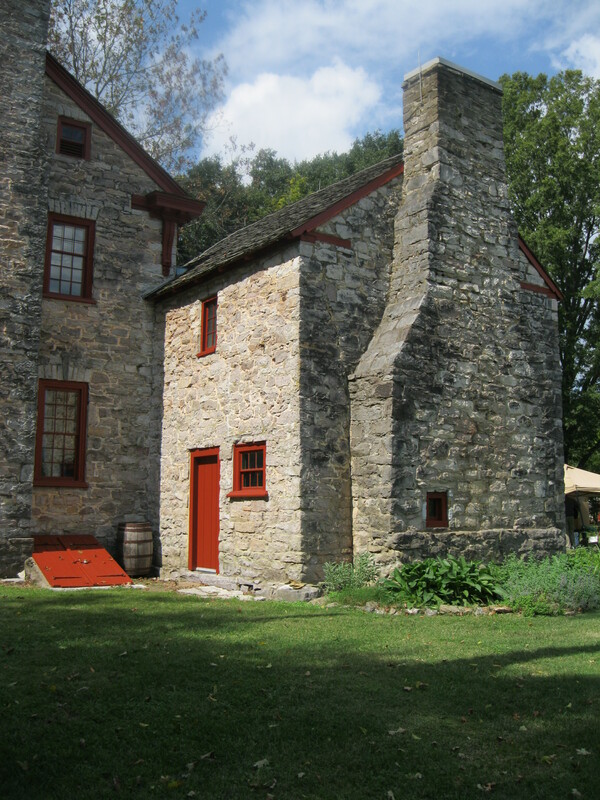 The house was listed on the National Register of Historic Places in 1969. Last Saturday there was an open day and we went along to look at it. There was a Craft Fare in the grounds and the weather was lovely so we had a great time looking round the house and visiting all the stalls. Unfortunately we were not allowed to take photos inside the house so there are none of those to look at, but if you ever get the chance do visit it yourself. It’s well worth the trip. So here I am outside the house. 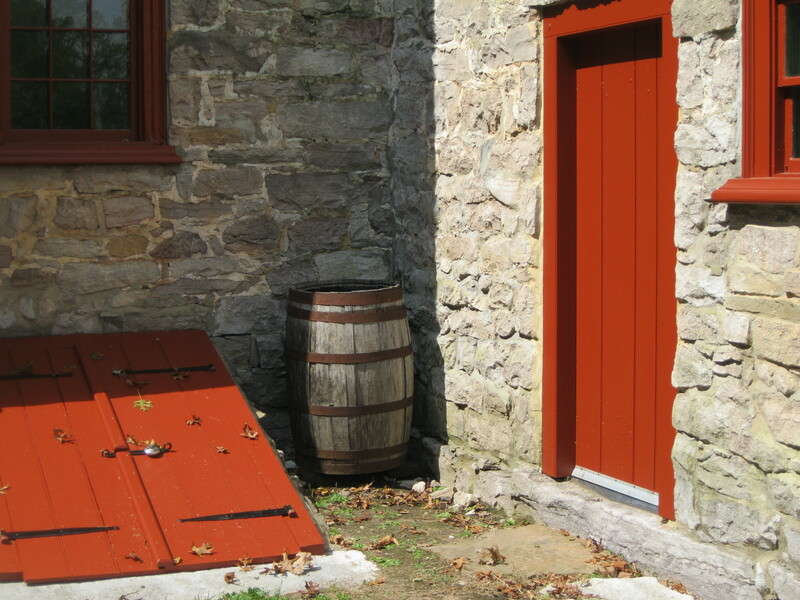 There is a central door with a path leading up to it, but we were told that the original residents didn’t use the path much, preferring to go round the back because the area at the front of the house is swampy. Opposite the house on the other side of the road was a large, swampy pond. At least one of the original owner’s children died from Malaria which was caused by a mosquito bite. Mosquitos breed in watery places. After the death of his dear child, the owner had the pond drained. How sad to lose a little girl like that. 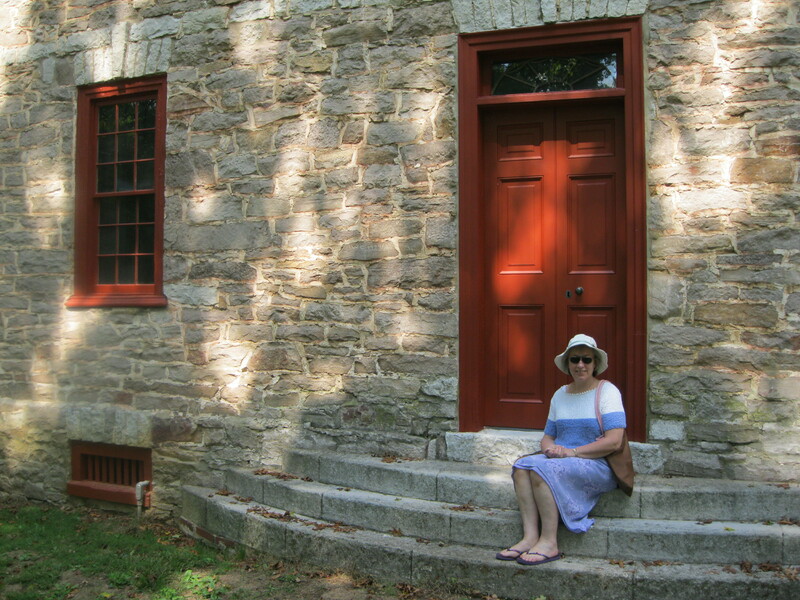 The house has a central door on the first floor, right above the main front door. 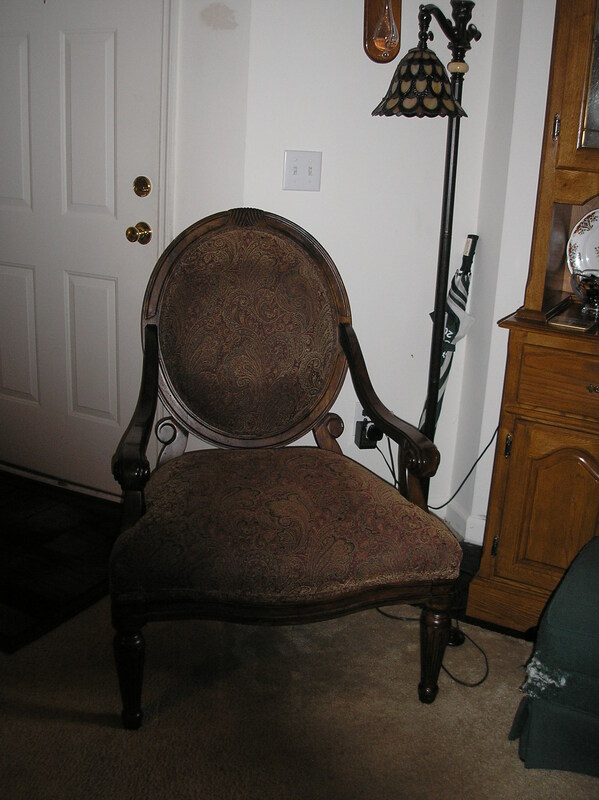 This was used when furniture needed upstairs. The furniture would be hoisted up and through that door. 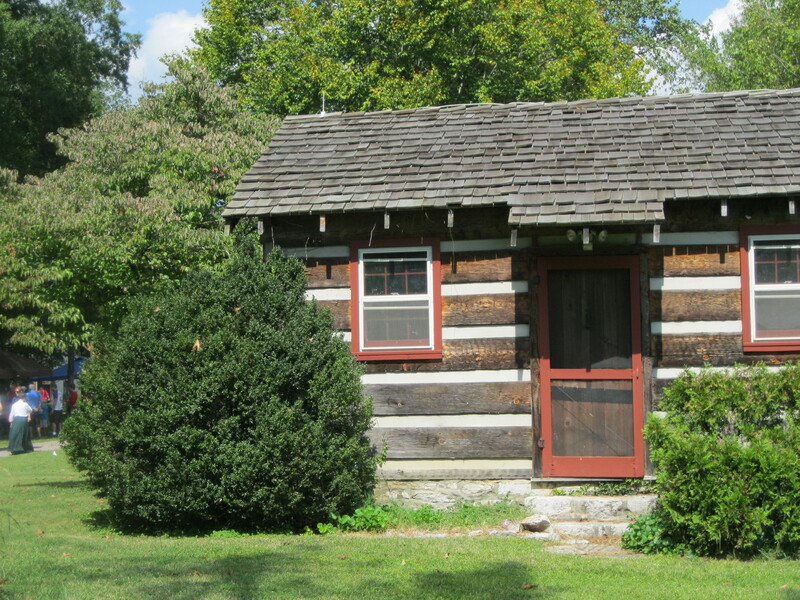 To the right of the main house is a log cabin. You can see it in the picture. At first I thought this was going to be the kitchen, but later found out that it was the original house where the owner and his family lived whilst the main house was being built. To build and own a house as large as this one made the owner a rich man because most people would have lived in a log cabin in those days. The next picture shows the kitchen which was added on to the main house. 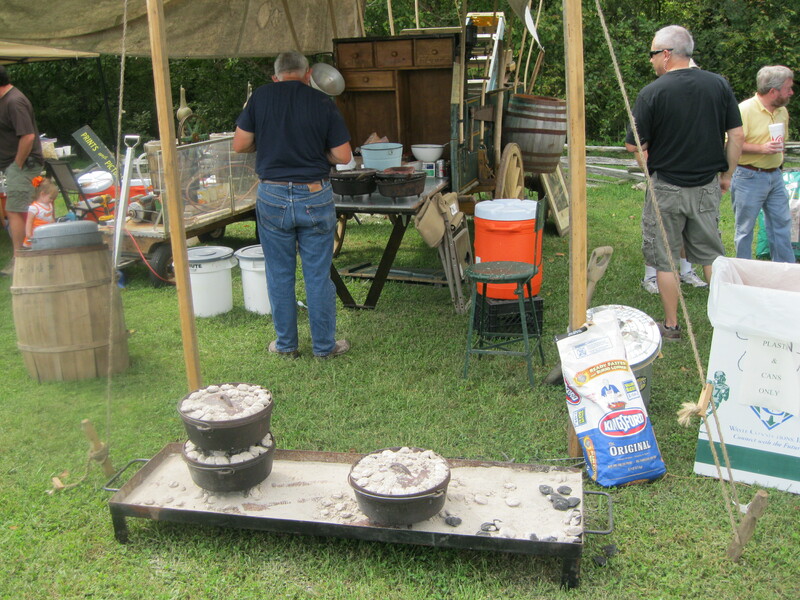 Usually the kitchen was in a separate building owing to the risk of fire. If the kitchen caught fire, then it probably would not spread to the main house. That was their way of thinking back then. 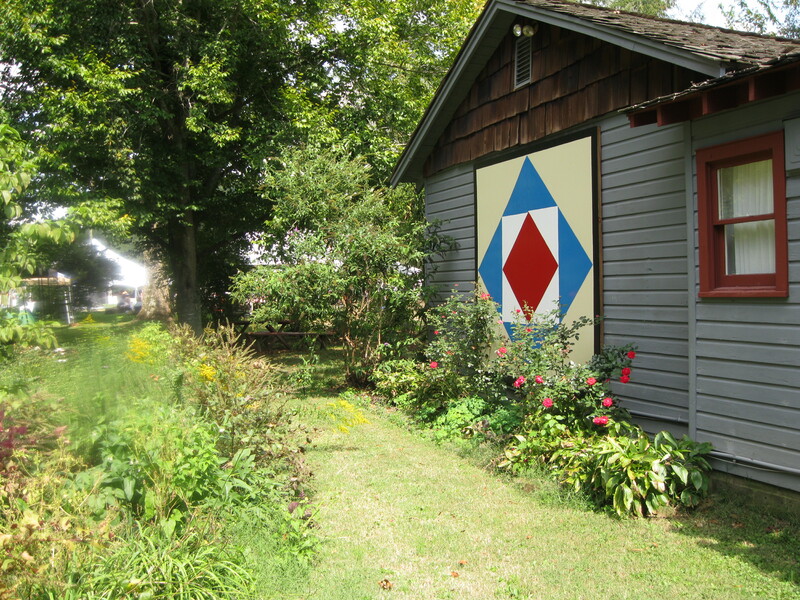 This is a wooden house quilt on the wall. Isn’t it pretty? 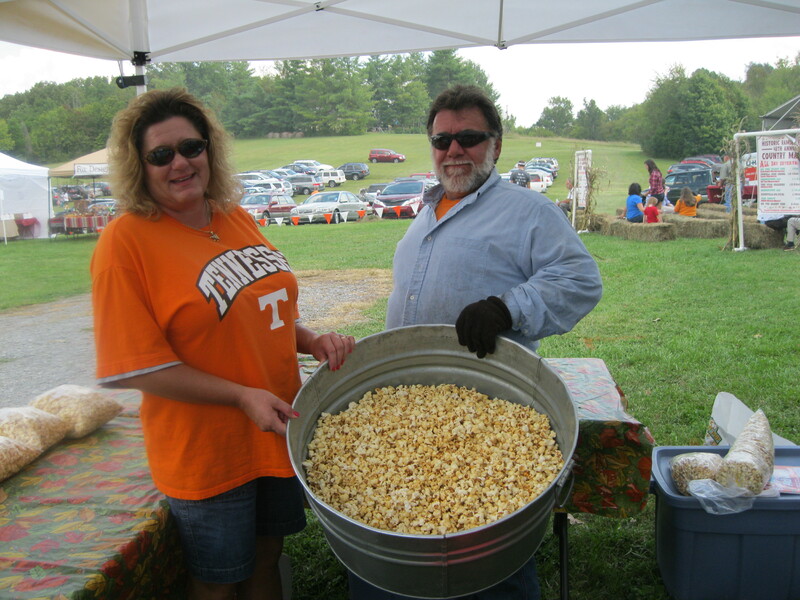 One of the first stalls we came across was a friendly couple who were making and selling popcorn. 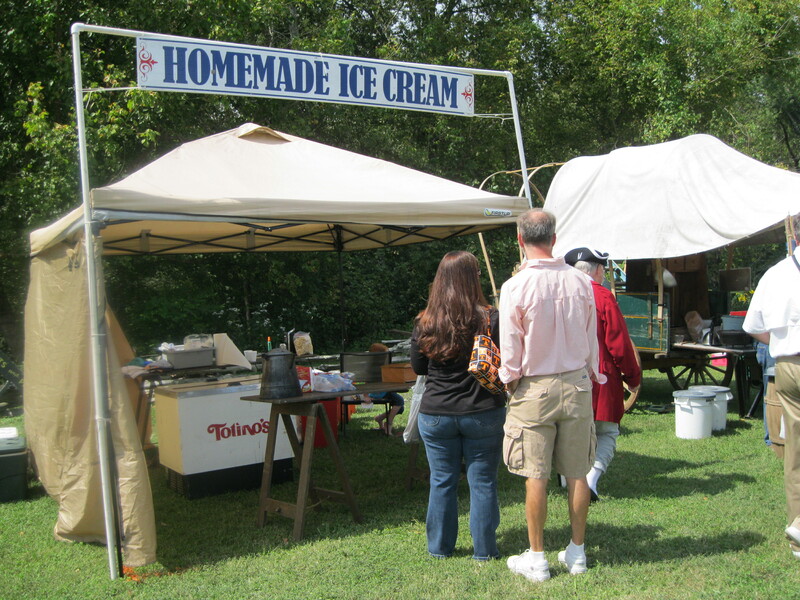 …and soon after a stall selling home-made ice cream. We had to try it! 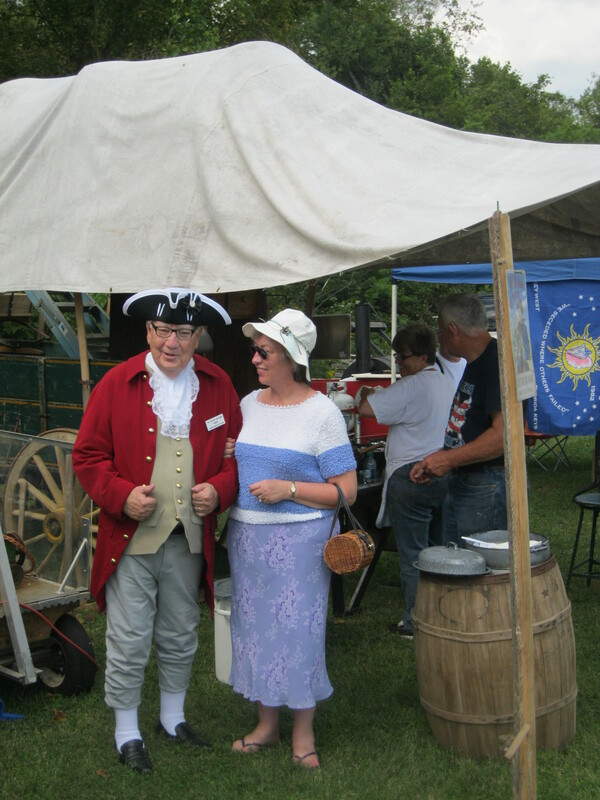 Then I found this lovely old veteran from the Civil War and asked if I could have my picture taken with him. He obliged and this is the result. 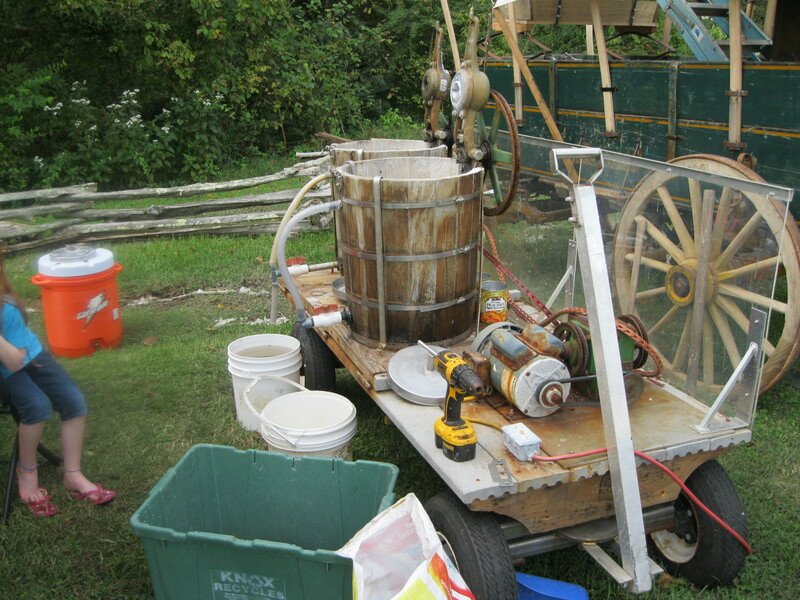 Next picture shows the back of the home-made ice cream stall with all the paraphernalia needed to make the delicious ice cream. 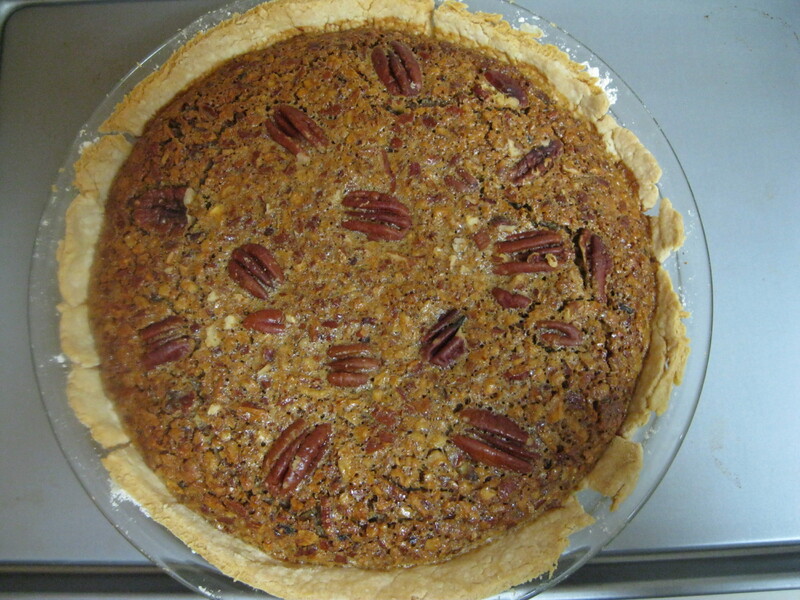 Pecan Pie – a recipe from Oma’s kitchen. 1 pastry case apx. 9 inch. 1 tablespoon of butter or soft margarine for my English friends. 1 cup of dark brown sugar, 4 ozs for my English friends. 1 cup of Corn Syrup, 4 ozs for my English friends. 3 medium sized eggs, beaten. Interesting Fact: In America white eggs are deemed to be superior whereas in England it’s the brown ones. I’ve tasted both and I can’t tell the difference. However, I prefer the look of the brown ones. How about you? 1 teaspoon Vanilla essence. Use the real stuff not the flavouring. 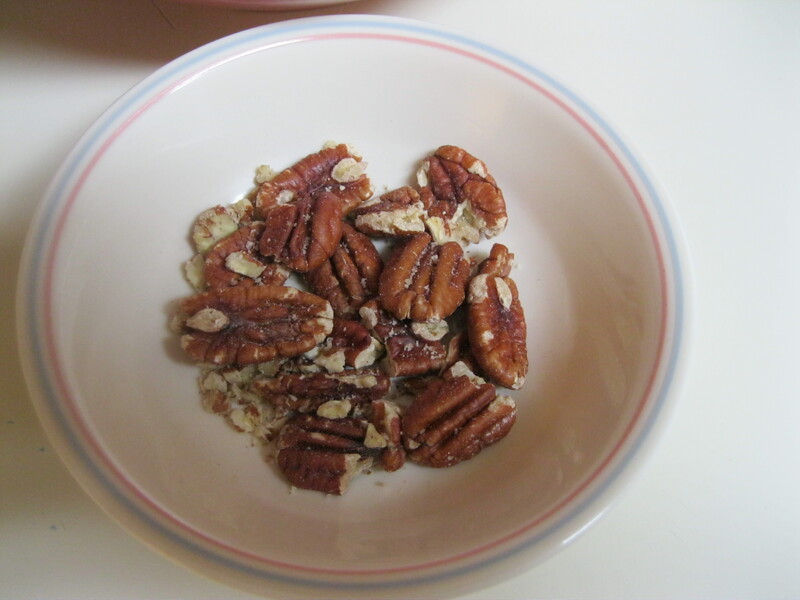 1 cup of Pecan nuts, 4 ozs for my English friends. Crush some of the nuts, leaving a few for decoration on the top of the pie. 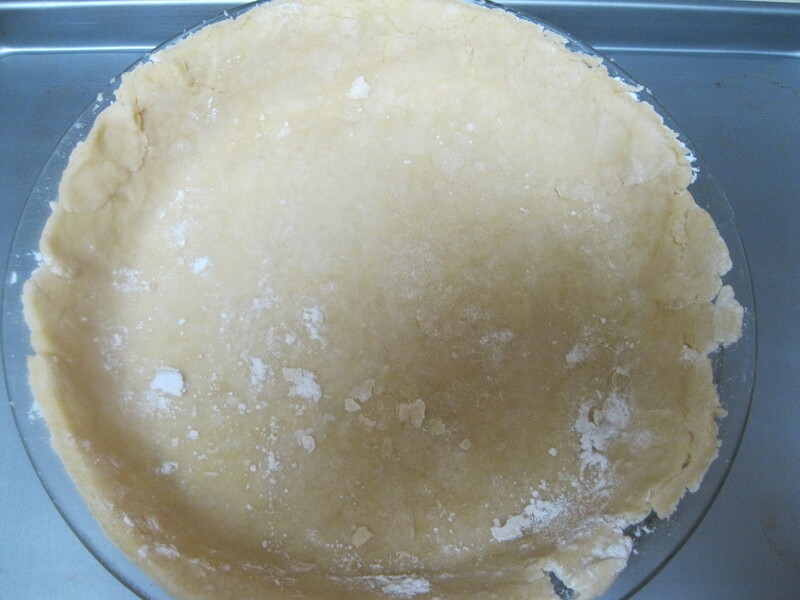 Precook the pastry shell for 5 minutes at 425 degs electric or Gas 7. Then turn down the oven to 350 degs (Gas 5). 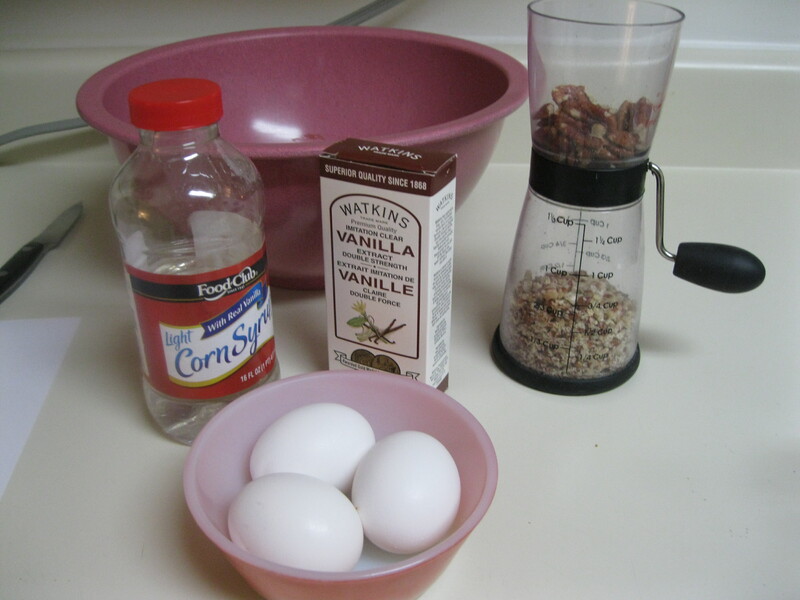 Cream the butter and sugar, add the Corn Syrup, eggs and vanilla. 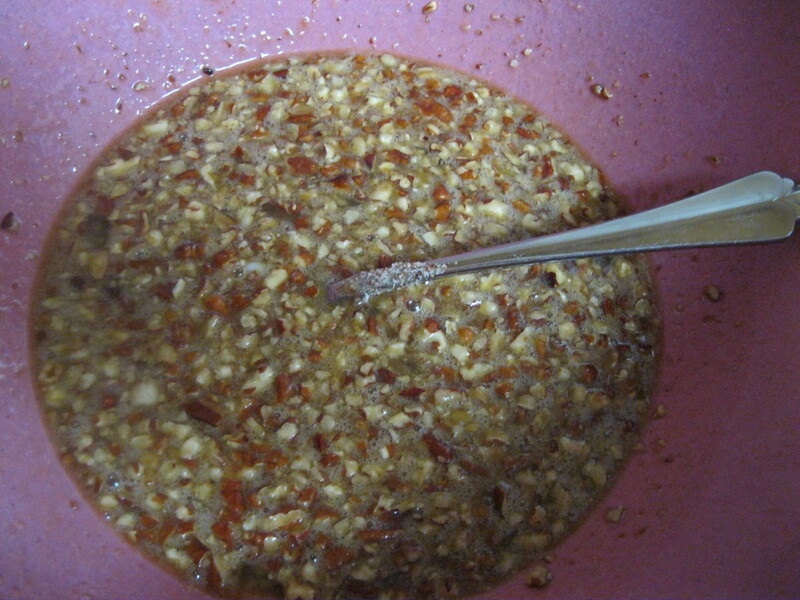 Mix well, then add the pecans. Pour into the prepared crust and bake in the centre of the oven until the filling is firm, which in the oven over here took 45 minutes. I prefer to eat the pie warm, but I’m told it is equally delicious. My husband Larry, who is an expert at eating pies, said it turned out just right! I encourage you to have a go because it really isn’t difficult and it’s something a little bit different. This is a recipe from Oma’s kitchen. 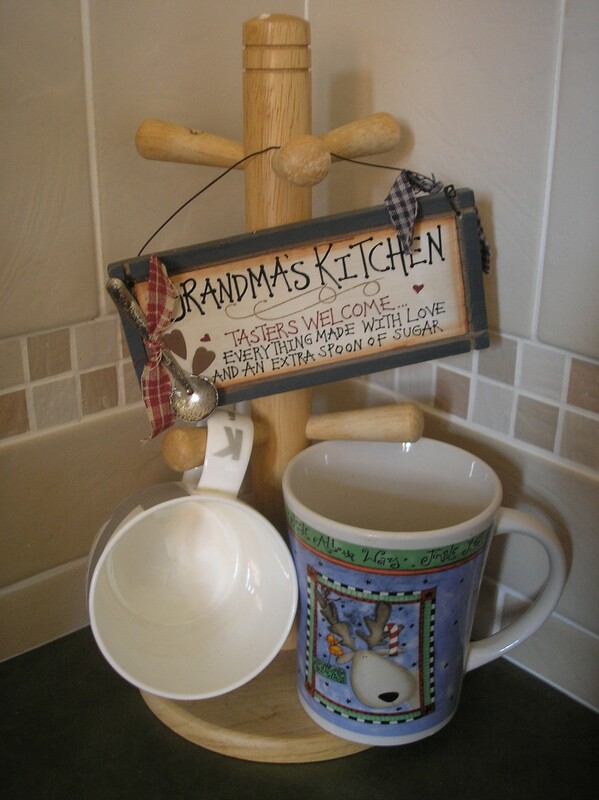 The original comes from Diana Rattray. My regular readers will know that Oma has been uprooted and transplanted into Tennessee for the next few weeks. Incredibly, I have been here for one week already! The other day we went for a very pleasant walk around the University of Tennessee pleasure gardens, which is where I took these photos. Now I need your help because I don’t know what a lot of these tropical plants are called. Please could you tell me if you know? 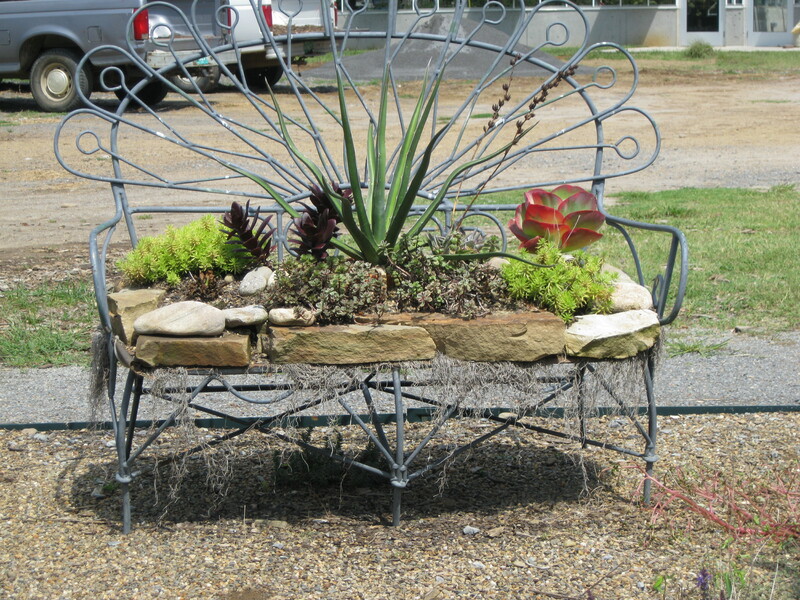 The first picture, above, shows some very pretty plants, which look like a kind of aloe vera. Am I right? 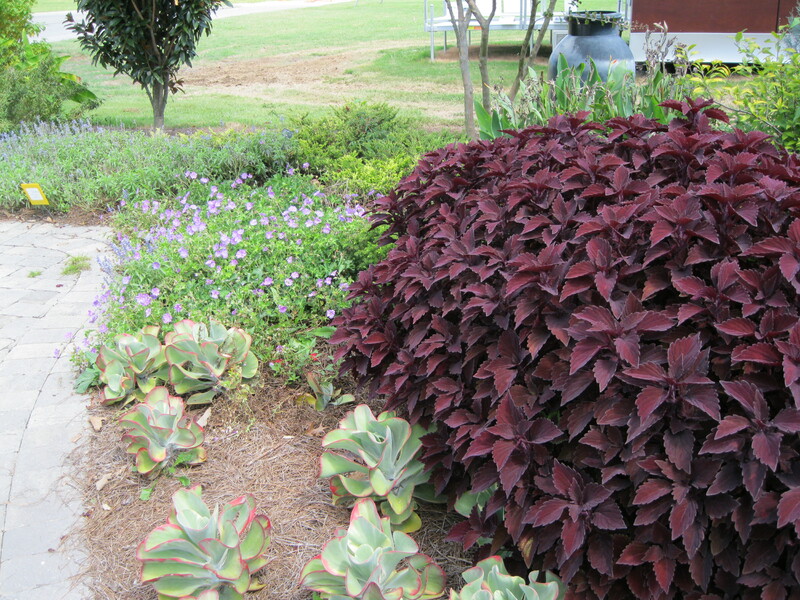 The red plant in the next picture reminds me of a coleus. Am I right or is it something completely different? 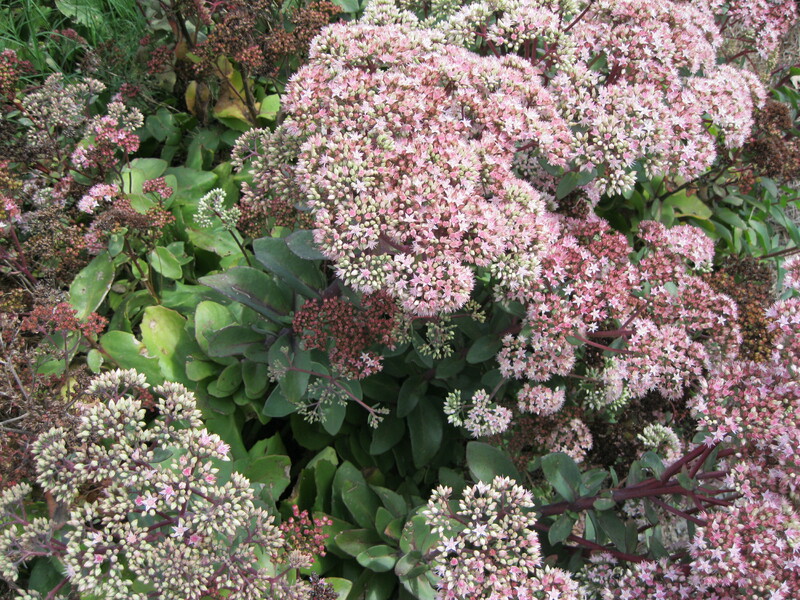 I know that the next very pretty pink plant is a Sedum. Anyone know which variety of Sedum. 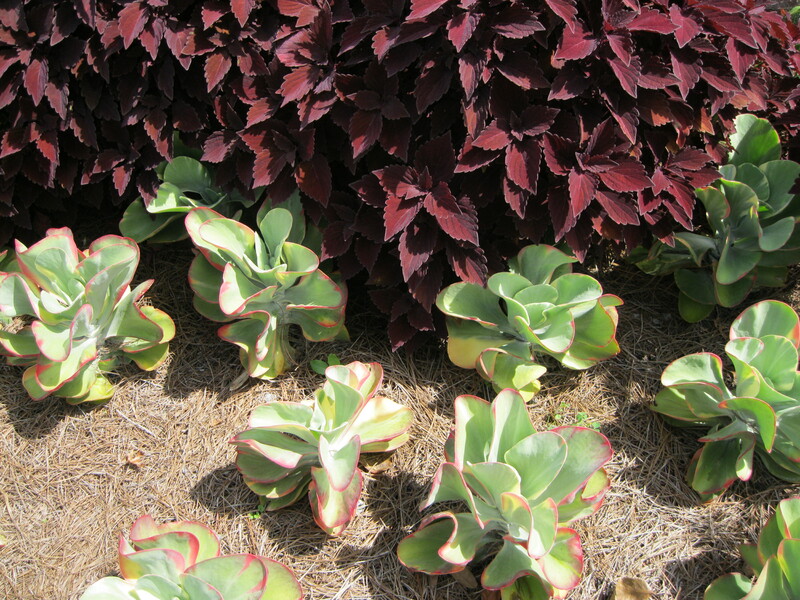 Sedum is known also as an Ice Plant and it is very popular with butterflies and bees. 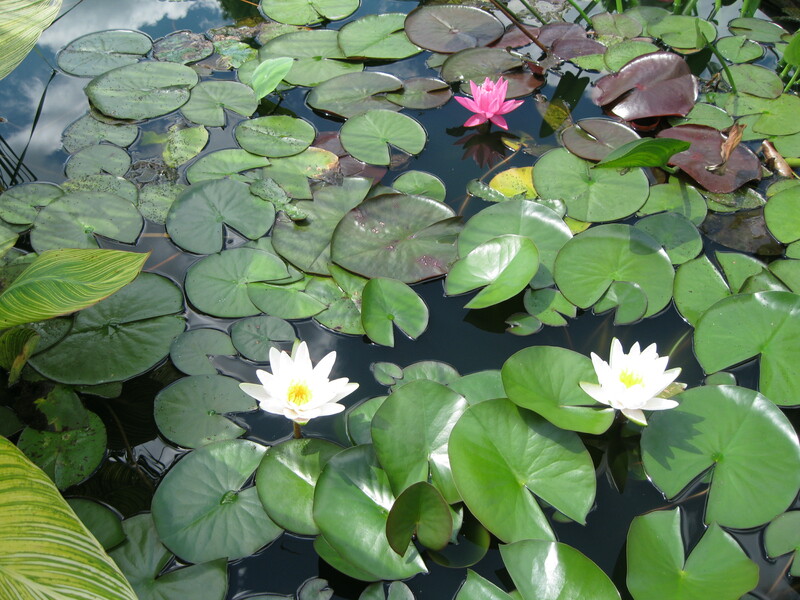 No prizes for the next pic., which shows some gorgeous water lillies doing their thing in a man-made pond. Just lovely. How about these yellow beauties? Anyone know what they are? Now the cactus. 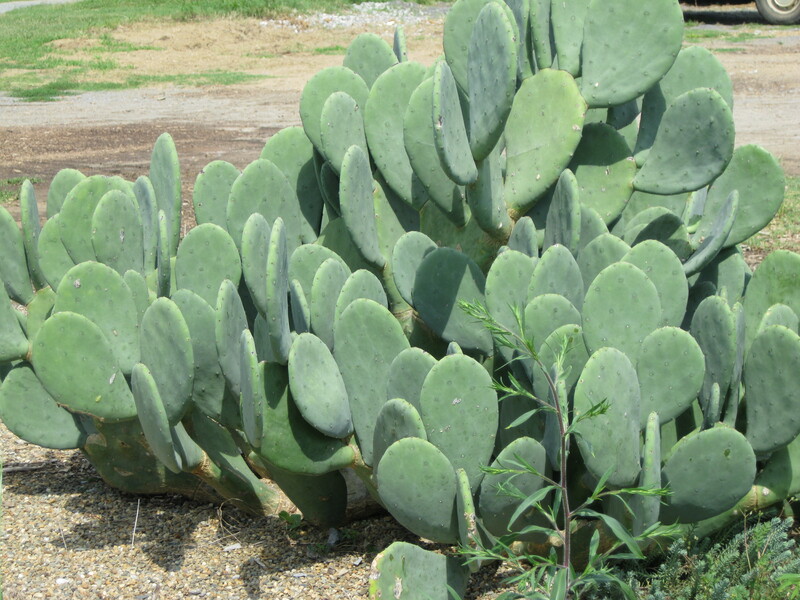 What sort of cactus is it and is the fruit edible? I’ve seen fruit on this before when I’ve been over but I have no idea if it is edible or what to do with it if it is. 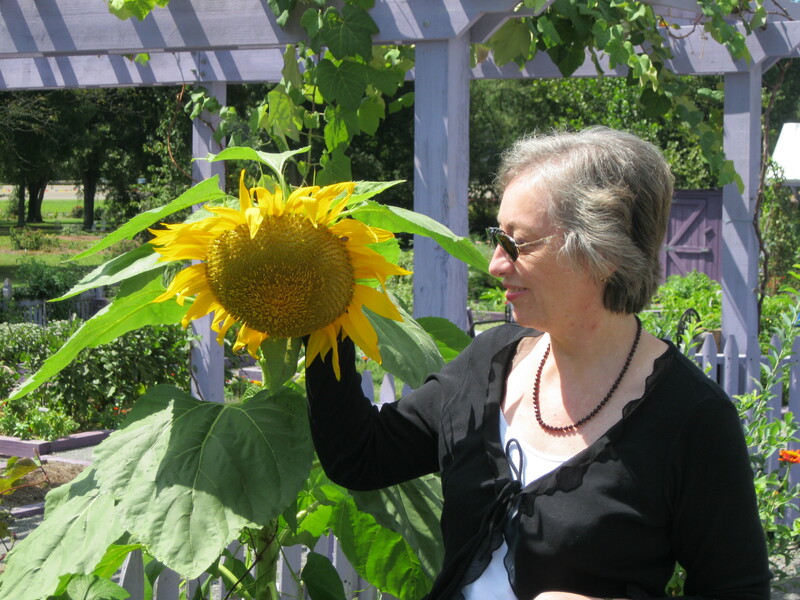 The last picture today shows me admiring a sunflower. It is full of seeds and the birds were enjoying them. I have more pictures, but that will do for today. The last time I went to the University Pleasure Gardens was back in February when almost everything was dormant. What a difference I saw this week. 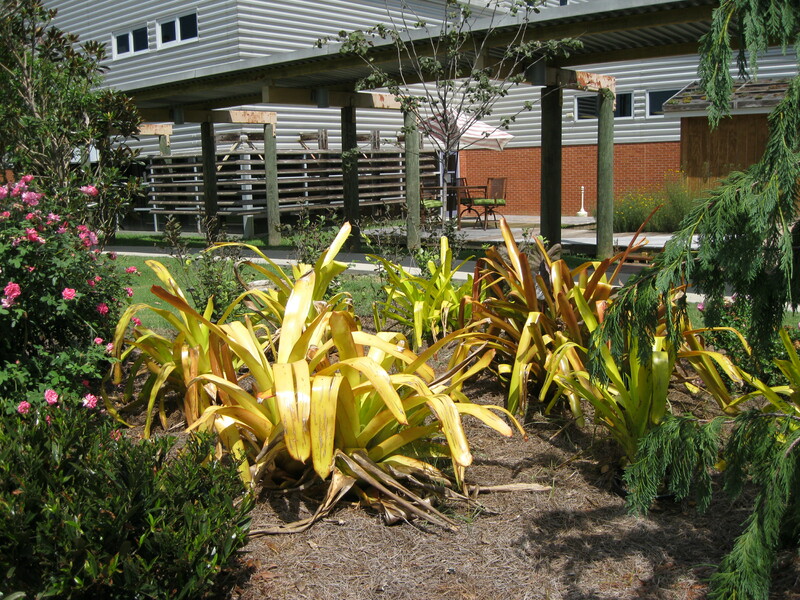 Lots of colour and vibrant growth and the butterflies were gorgeous. My first impressions of America were made in Atlanta, on arriving there from England for the very first time in April 2006. I was going to spend ten days with my Fanstory friend, L and I was very excited about it. Atlanta airport is massive and I, having been detained in the immigration office for four hours, was unsure of where to go next. I was alone with my carry-on bag as I found my way down the long escalator to the two waiting underground trains. I had no idea where they went. In my mind, I thought they probably went to downtown Atlanta and that was definitely not where I wanted to be. I needed to meet up with L and as quickly as possible. Would he still be waiting for me, after four long hours with no communication? He would know that the plane had arrived and must be wondering where the hell I was since everybody else had already come through the International Arrivals. I discovered all too late in the immigration office that my English mobile phone did not work in America, despite the fact that the young man in the telecom office in my local shopping mall in England, assured me that it would work! I decided to ask the immigration officer if he would be kind enough to phone my friend and let him know that I had been delayed. He did let L know, but not by phone, so at least L knew I was in the airport, but other than that, L would not know why I had taken so long to reach him. Perhaps he would guess what had happened or perhaps not. I had no way of knowing. I began to worry that L would get tired or fed up waiting and return to the hotel he had booked for us to stay in that night. I looked at the two trains and decided not to get on either of them. I would ask directions first. There was no-one around down there in the train hall so I went back up the escalator to find the Enquiries Desk and asked one of the airport officials if they could tell me how to get to the International Arrivals desk? They looked at me as if I was stupid and indeed I did feel stupid. On the other hand, I had never been to Atlanta before or America even and I was not familiar with the airport or the systems they had in place there. They told me they couldn’t help me, which to this day I find remarkable, so back I went down the escalator again. Since there was nowhere else to go but onto the train, I tentatively got on it and went a couple of stops. Then I got off. I looked around, but could find no map of the airport to help me and still there was no-one else around to ask. I decided it was pointless to ask a fellow passenger, who would probably be as befuddled as I was. A cleaning lady, pushing a large trolley full of mops and buckets and cleaning equipment came into view. I asked her for directions. ‘I want to go to the International Arrivals,’ I told her. She was more helpful than anyone else I had so far encountered, telling me to get back on the train and go to the Baggage Hall, which was at the end of the train ride. I was relieved to hear that. At least I wouldn’t find myself in the middle of the metropolis, out of the airport and completely lost. I got back onto the train. The stops on the train ride are labelled in letters of the alphabet and a mechanical voice tells you where you are, not necessarily where you want to be. ‘This train is now stopping’, the disembodied voice kept telling me. ‘The next stop is Concourse C’…. At the baggage hall I felt my feet getting sore. I was wearing high-heeled shoes and they had begun to pinch. I looked around for the console containing the luggage from flight BA226. There was none. I concluded that everyone else had already got theirs and mine was who knows where! My heart sank. My new camera was in that bag. Again I would have to find help and ask where the bag was likely to be. All this took more time than I wanted it to. Eventually, I was told that my bag would have been taken to the B.A. office at the front of the airport and I would be able to claim in the next day after 12 o’clock noon. I did a quick time check. That would mean that L and I would have to stay near the airport in order to pick up my bag from the left luggage after noon, when the Check-In office opened. That meant that we would not be able to leave the airport when we wanted to, but would have to wait at BA’s convenience. ‘Could this get much worse?’ I wondered, scenes from the movie ‘Terminal’ playing in my mind. Perhaps I would be marooned in the airport forever more unable to find a way out or locate my friend. Plan C suggested looking for food in rubbish bins in order to stay alive and sleeping in corners where no-one would see me, but the mind was playing tricks because I was tired. Fighting off the need to cry, I saw another escalator ahead of me. Surely this one would lead to the Arrivals Hall? If I didn’t see L soon, I would go mad. There is only so much one person can stand and I was reaching that limit. I walked towards the escalator, clutching my carry-on bag tight. Stepping on, the escalator began to ascend. I could see an enormous mural at the top, welcoming new arrivals. I must be in the right place, but would L be there for me or would I be all alone in this new land?